All over the world, we celebrate Christmas as an international festival with Christmas greetings, sweets, gifts and a visit to the neighborhood church. It is celebrated on every 25th of December. It is a global celebration when all offices, schools, and colleges are closed as a holiday all over the world. Christmas is celebrated to commemorate the birth of Jesus. He was born as a savior of all people to enlighten them from their innocence and mistakes. And to protect them from evils. It is the love of mankind and the need to uplift them from their innocence; and, to protect them from the evil that made Jesus take a birth in this world. He sacrificed himself for their good and thereafter relived again to guide them throughout their life. According to the traditional belief, Christ was born to virgin Mary in the Palestinian city of Bethlehem, near South Jerusalem on the midnight of 24-25 December. As she had no room to keep him, she placed him in a manger of a cattle shed. Angels proclaimed the child as the savior of all people. And hearing this, the nearby shepherds reached him to adore him and glorify him. So, traditional celebrations of most Roman Catholics and Anglicans start from the late evening hours before the midnight of 24th December to celebrate the birth of Jesus. These celebrations are known as Holy Night and Midnight Mass celebrations. On this occasion, the Lord's table is decorated with Advent wreath. Advent Wreath is one round garland made up of green branches and flowers which is placed on a white cloth on the Table with a big white candle in the center of the wreath. The white candle resembles the Christ Candle. Then, it is surrounded by other small candles. 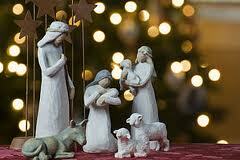 The participants sing the Holy Night and Midnight Mass carols or songs glorifying Child Jesus and Holy Mother Mary. On Christmas Eve, many traditional believers observe fast till evening and they take food only after citing the first star in the evening sky symbolizing the star of Bethlehem. They prepare meatless dishes numbering twelve items. But most others take meat dishes also. It varies from belief to belief and region to region. They celebrate this occasion with their family members and friends and relatives also. After viewing of the star, they take food and assemble again for Midnight Mass. The whole night is passed with divine chantings and prayers. All houses, churches, and offices are beautifully decorated for this festival from 24th evening itself. During dining, they decorate the table holistically. The table is covered with a white tablecloth commemorating the swaddling clothes of Child Jesus when he was born. A large white candle is placed on the table and next to it the round loaf of bread symbolizing the Christ Bread of Life. Hay is also spread on one side by some people to commemorate the manger of Bethlehem. Others put hay in a corner of the room as decoration. Next day morning, The Divine Liturgy or The Holy Mass is celebrated. People gather in churches wearing new clothes and observe the Holy Mass Prayers glorifying the great sacrifice and rebirth of Jesus Christ. It is the prayer which is recited by the Priest as well as the people assembled there in a systematic way.Their heart, eyes, and mouth are fully devoted at the Altar. After the prayers, they greet each other with the Kiss of Peace saying "Christ is Born" to each other. The greeted person will reply with the words "Glorify Him".Then, returning home, they take food, distribute sweets and gifts among their circles and enjoy the day with games and movies, etc. The most popular trends of celebrating Christmas nowadays is to wear new clothes, decorate homes beautifully with lights and colors and with a beautifully decorated Christmas tree, and preparation of several types of food dishes, distribution of greeting cards and sweets to friends and circles and enjoyment on the whole day. 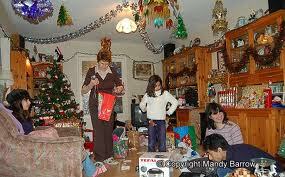 Children are the happiest on this occasion as they receive many gifts from their parents. It is believed that Santa Claus comes in the midnight and leaves great gifts to good children. But, nowadays, we know that it is the parents who place the gifts to the children on behalf of Santa Claus.